On average, those with an advanced degree can earn up to $20,000 more than those holding only a four-year diploma. Keep on going toward a doctorate, and you can hit upwards of a $30,000 increase. I used to hear all the time, “just get your four-year degree, and you will be set.” While this advice was well-meaning, and I did go on to get that B.S., it’s also outdated. Today’s business professionals are learning that a graduate degree is much more valuable in a wide variety of disciplines. In fact, not only is it beneficial – it is quickly becoming a necessity. Bachelor degrees are the new high school diploma, and the way to guarantee yourself a career after graduation is to walk away with your M.S. Need more of a reason to continue your education? This is probably a given, but it still rings true – more now than ever. While many professionals once benefited from an internal salary increase upon receiving a graduate degree, prospective employees are now actually being weeded out of the consideration pool without one. If you’re dissatisfied with your current position and you hope to be promoted either within your current place of employment or to venture out into a new opportunity, you will be competing against those who have completed their master’s degree or further. 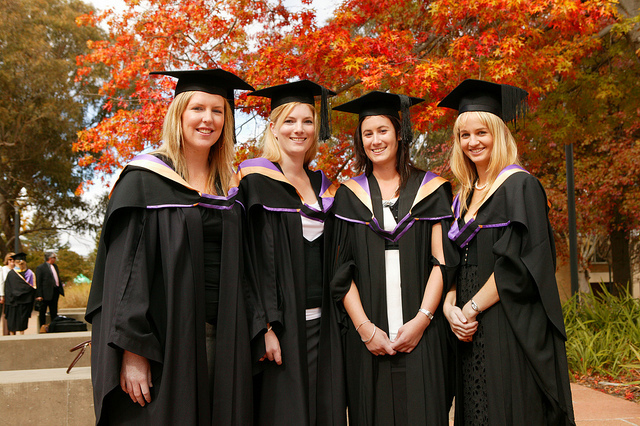 While a bachelor’s degree once held prestige, it is now often considered to be just a basic requirement. If you’ve dreamed of working in the medical or engineering fields, or any other prestigious field for that matter, you’ll need quite a story to excuse a lack of graduate work. Since these fields are so financially lucrative and offer continuous advancement opportunities, even entry level positions usually require a master’s degree of some sort. Even if your advanced degree isn’t in the field you hope to pursue, it can still get your foot in the door. Many employers will hire a candidate with the right mindset and attitude, assuming they will be continuing the necessary education after starting work. Thus, having an M.A. in English as you pursue Radiology, is still worth more than having nothing at all. Employers will be fair and patient for the right candidate, but more education shows you are disciplined, motivated, and of course, knowledgable. The more you’ve already prepared for when it comes to education, the easier a time you’ll have getting someone to pause at your resume. Returning to graduate school, especially after years away from the classroom, is not always just about future job prospects. Those who head back to school often feel they’ve gotten a new perspective on their professional and personal life. Make new friends, discover new passions and form a new perspective on the world you wouldn’t normally have. And, as a bonus, make a way for yourself to have a rewarding new career and a larger income to enjoy the things in life you discover you love along the way! Perhaps they were all right when they told me to just go to school. I certainly have plenty of memories from my four years that truly shaped who I am today – both personally and financially. However, many will certainly find that taking that wisdom as far as the sky’s limit will bring even greater experiences worth writing home about.